In the summer of 2013 Bob Grosch contacted me and asked that I create a painting for him that he could pass on to his daughter Liz. 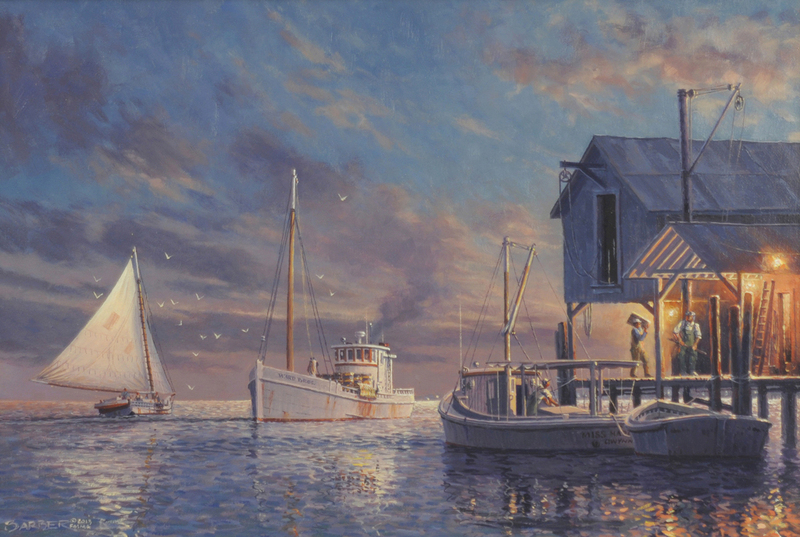 We met in my studio and he said that he particularly liked my scenes of workboats in the harbor and getting underway at dawn. Bob explained that his desire for a dawn scene was “because to me, dawn is symbolic of new beginnings with unlimited promise of things to come.” We looked at several of my earlier images and I felt that I had a good sense of what he wanted. After several months and after finishing paintings already ordered by others it was time to begin Bob and Liz’s piece. I did a pen sketch, [see below] the purpose of which would be to illustrate the composition of the painting to come. I emailed the sketch to Bob and he reported his pleasure upon seeing it. With his approval I painted the small oil study. This is when we can see, not only the arrangement of elements in the art but also, the coloration and “atmosphere” of the proposed piece. After living with the study for a few days I felt that the boats were too large and sent the color image to Bob and expressed my concern. He agreed and I did a second pen sketch with the boats smaller. We both were much happier with the new arrangement. With the client’s OK I painted the final version. Just before Christmas, Bob visited my studio again for the “unveiling”. He was as pleased with the painting as I was. Bob, it was a true pleasure working with you on this project and I hope that you, Liz, other family and friends enjoy “Chesapeake Dawn” for many generations. 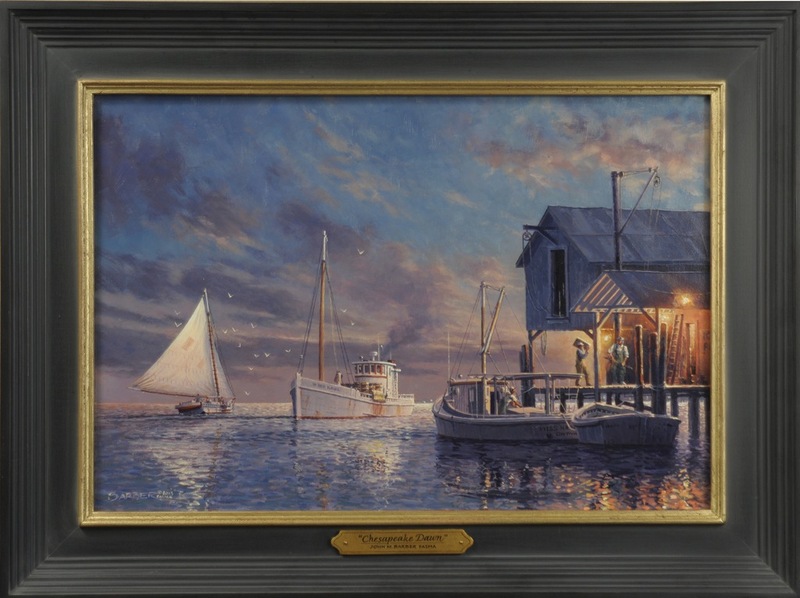 “Chesapeake Dawn” is oil on linen canvas measuring 13″ x 19″, framed in a custom-made Antwerp black and gold frame with overall measurements of 18″ x 24″. The piece was finished with a hand-lettered gold nameplate and House of Troy painting light.